“Committed” Heads for the Red Carpet! 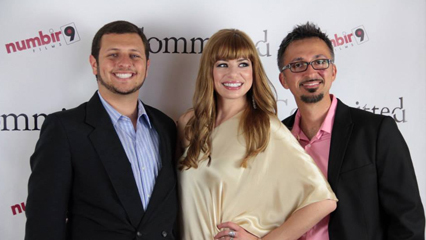 On June 7, 2014, the cast and crew of “Committed” celebrated the short film’s preliminary release at a private red carpet premiere in Newport Beach, CA. The film had 4 viewings, and each one was extremely well received. “Committed” has been a year long project which began in July 2013. The story came about as a result of a dinner conversation between numbir9 films director, Mehran Torgoley, actress/producer Llana Barron, and Upright Citizens Brigade comedian/writer/actress, Santina Muha. 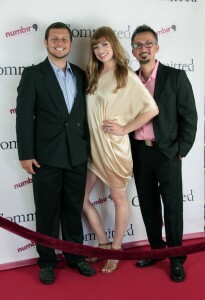 “Committed” is a short film written by Llana Barron and Mehran Torgoley. It tells the story of Evelyn Johnson (Llana Barron), a compassionate nurse in an overcrowded mental hospital in 1951, and her struggle to prove the sanity of Clara (Santina Muha), a young woman bound to a wheelchair. Using beautiful and eerie noir-style imagery, the film explores the terrors of mental health in the early 1950’s when electroshock therapy was still the primary form of treatment. It was a time in America when virtually anyone could be committed to a state mental hospital, especially women, with little to no evidence of mental illness. Male doctors dominated the industry, nurses were overworked and underpaid, and mental patients were treated like animals. In the film, Nurse Johnson must overcome many obstacles to prove Clara’s sanity. She challenges the status quo with her demands. Dr. Harlin (John Copeland), the hospital’s head psychiatrist, is not easily swayed. His enforcer, Nurse Joan Archer (Joanne Atkinson), the hospital’s ruthless and cruel head nurse, makes multiple attempts to undermine the passionate nurse. Stay posted for summer viewing information at a film festival near you!